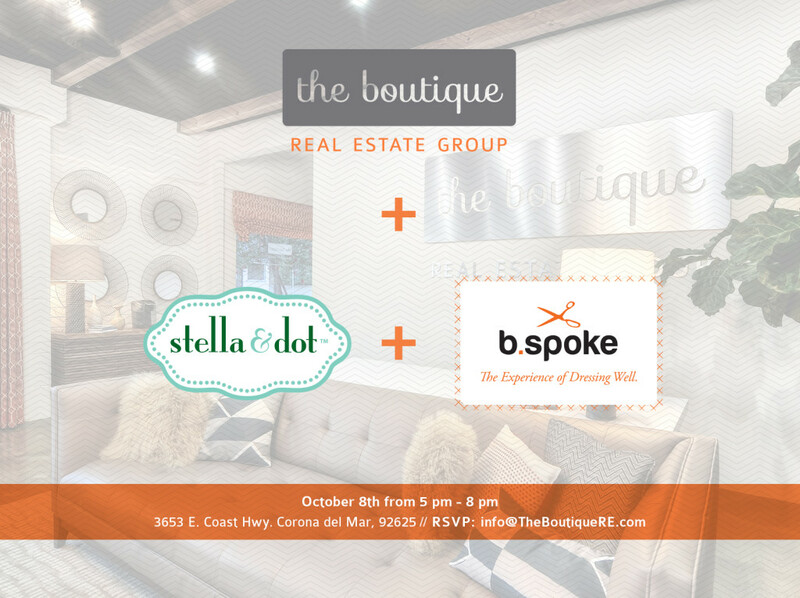 Join us on October 8th from 5-8pm as we experience Stella & Dot and b.Spoke Men’s Custom Clothier at our headquarters at The Boutique Real Estate Group in Corona del Mar. Stella & Dot: We are Stella & Dot. A boutique-style jewelry & accessories company inspired by and created for strong, stylish women everywhere. b.Spoke: It is your brand, your identity and it illustrates what others can expect from you. We don’t make assumptions. We ask questions. We’ll ask about your business, your clients, your lifestyle, and what you want your clothing to say about you. The Boutique Real Estate Group: A Worldwide Luxury Residential Real Estate Brokerage. Born in The OC.